Build balanced meals. If you’re hungry soon after a meal, you might not be getting enough of the right stuff. Start with non-starchy carbs that are high in fiber, like fruits and veggies. Add plenty of protein (you can go as high as 2gm per kg weight if you are training) and a dose of healthy fats. Whole-grain carbs can also help. These nutrients are good for your body and promote fullness, so you’ll be less likely to experience hunger between meals. Drink lots of water. I know; you hear this advice all the time. But it’s really good advice! Staying hydrated can really help with weight loss and maintenance, since it’s easy to mistake thirst for hunger. Next time you feel snacky, try a tall glass of water. Then wait a few minutes to see if your hunger subsides. Eat several mini meals instead of three big meals. The three-square-meals model doesn’t work for everyone. If you get really hungry between meals, try eating a mini meal every few hours instead. Cut back on starchy, sugary carbs. Carbs like candy and cookies are nothing but empty calories. They satisfy hunger pangs for the moment, but they don’t keep you full. End your meal with a small sweet treat. 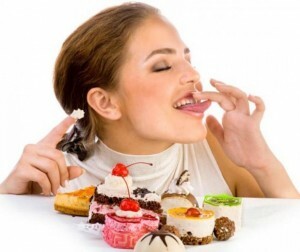 Capping off your meal with something sweet can signal your brain that you’re done eating. Think a few Hershey’s Kisses, some fruit, or a cup of coffee with no-calorie sweetener. Keep a food journal or track your consumption on-line Tracking your food is one of the best things you can do if you’re trying to lose weight or change your eating habits. Write down everything you eat, and look for patterns. What are you eating . you find yourself extra hungry? Certain foods may be triggers for you, leaving you hungrier than before you ate them. Go for a walk. You might feel like you’re hungry when you’re really just bored or restless. Next time you have an urge to hit the pantry or the fridge, try walking around the block instead. Bonus: Extra calories burned!